Arcadia Jail CA | Arrest, Bail & Bail Bondsman Info. Arcadia Jail CA | Arrest, Bail & Bail Bondsman Info. The Arcadia Police Station has a small holding facility that will house around 30 or so inmates. Due to how small the jail is, once bail is posted an inmate can be released in as little as 30 minutes. However, it also means that, should the jail become overcrowded, inmates will be transferred out to larger facilities, significantly increasing their time in custody. 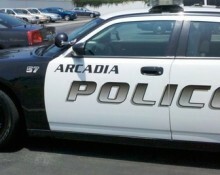 If a friend or loved one has recently been arrested and taken into custody in Arcadia, it is likely that they are located at the Arcadia City Jail. We know that this is a pretty stressful time, and that you’ve probably got a lot of questions. Lucky for you, we have the answers. Call for a free consultation and speak with a friendly, licensed bail bondsman any time day or night. We are available to help locate your friend or loved one and to get the bail bond application process started. Finding out that a friend or loved one has been arrested usually comes as a surprise. As such, an experienced bail bondsman is standing by 24/7 in order to take your call at 855-414-BAIL (2245). Let us help you out. We are proud to offer flexible payment options and financing designed to fit most any budget. Most clients, however, prefer to pay for a bail bond with their credit/debit card. We accept major credit cards including: Visa, Master Card, American Express, and Discover. It is also possible to pay for a bail bond with cash, business or personal check, money order, bank account transfer and money wire. If you require any more information on the Arcadia Jail in California, call and speak with a bail bondsman now at 855-414-2245. We are available every hour of every day to help serve your needs and get you through this difficult situation.